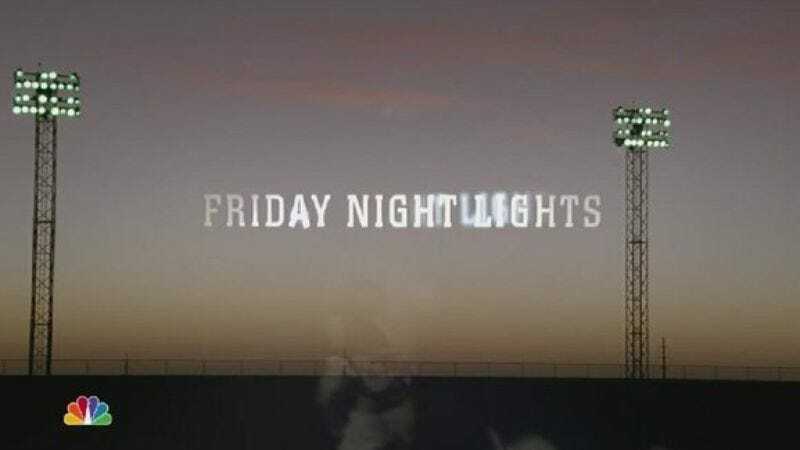 Friday Night Lights: "I Can't"
Now that I think about it, Julie didn’t have it that rough this week either. Habitat Ryan (played, as my estimable fellow Friday Night Lights’ blogger Andy Greenwald over at Vulture discovered, by one of the guys from the band All Time Low) returned for some more non-committal necking/pep-talking. He seems so flawless, I started wondering if the whole improving-the-world-through-building-houses thing was just an excuse to travel from town to town making out with impressionable fresh-faced high-schoolers trying to pad their college transcripts. Maybe that’s why Coach eyed him so suspiciously. Will the kid stay in the picture next week? I thought he’d be gone by now, actually. Here’s a possibly better question: If Julie stopped talking about him, would anyone notice he was still around? As far as bad weeks go, Coach could have had it worse. Sure, there was that vicious hangover that made being forced to walk a few feet to the car briefly seem like grounds for divorce, and he didn’t sleep much. 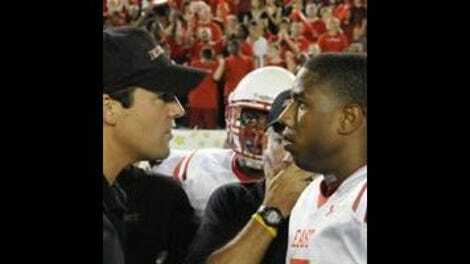 But he did have a breakthrough with Vince on the field and he let Tami do most of the fretting over a hypothetical Julie pregnancy and give counsel to Becky in her time of need. About Becky: I’ve been on the fence about the character and actress Madison Burge most of the season but now I can see the jittery, self-regarding immaturity that defined her in those early episodes as part of a grander design. She’s playing a girl locked into a situation that’s forcing her to grow up fast. This week the show, in appropriately agonizing detail, follows her through every step of her decision to end her pregnancy. She realizes her first instinct, to have the abortion, won’t simply let her go back to the life she led before as if nothing has happened. For one, Luke, Tim, and her mother will know. But even if they didn’t, she’ll know. She also recognizes, in the line that gives the episode the title, that she can’t raise a child under her present circumstances. Not in any way a child should be raised. The Becky scenes contain two particularly wrenching moments. In the first, Becky gazes at a picture of her infant self with her mother and realizes that, in a similar situation, her mother chose to have her. The second occurs in the midst of her tearful talk with Tami when she notes, “How awful it would be if I had the baby and spent the rest of my life resenting him. Or her.” If she didn’t know before, she knows now that her existence has, at least at times, caused her mother to resent her. That’s a hard knowledge to carry around and she doesn’t want to repeat the cycle. The title “I Can’t” could apply to Vince and Tim this week as well. Vince can’t go on caring for a mother who won’t care for herself. He also can’t afford to pay for his mother’s much-needed rehab and, after making careful choices to extricate himself from the criminal enterprises of East Dillon, he feels he has no choice but to trade his muscle for money. He’s trying to be a good kid, but feels forced to do the wrong thing for the good of his family. If the situation illustrates the way a cycle of crime, addiction, and poverty perpetuates itself a little too neatly, the acting from Angela Rawna and Michael B. Jordan keeps it grounded. Tim, meanwhile, can’t go on chop shopping any longer, particularly now that it’s forced him to take to burying the shells of cars in the middle of the night like serial killers with fresh kills. It seems like a happy end to the Riggins Boys’ life of crime, but they live in a town where nothing stays buried for good. • I’m a bit fuzzy on the laws governing abortion in Texas and how it played out here. I understand that the doctor had to tell Becky the approximate gestational age of her fetus, but did she have to wait 24 hours? • Is running a chop shop that profitable? Billy owed a heap of money for medical bills, but now he apparently has money aplenty on top of what he owed? • Matt Lauria remains impressive as Luke as he tries to sort out his feelings about the fix he and Becky have gotten themselves into, finding his emotions racing by faster than he can process them only to land, in the last shot, on a shade of blue he won’t be able to shake soon.